Saturday, tempo ride, 30 miles, 2.5 hours. My knee felt much better today. Still some soreness, but I've concluded the problem was almost entirely in having my seat too low. I originally lowered it to help leverage better steering control on the foot paths (i.e. winter singletrack.) I greased the seatpost heavily because it is a tight fit anyway and always a beast to adjust, and I'm guessing that caused it to slip down a little more before it froze in place. I fixed the problem today with a little help and a lot of leverage from Geoff. I am going to install a new seatpost soon. 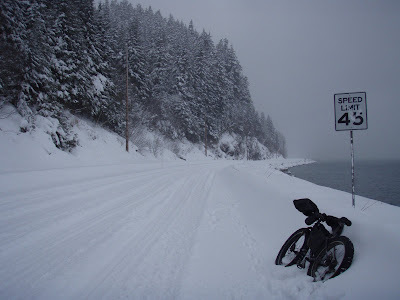 But I felt a lot more comfortable and even a little faster heading out North Douglas today, despite yet more new snow. I pedal as hard as I can, until my quads are screaming, but that doesn't really translate to speed in these conditions. I've decided that any time I average more than 10 mph, I can count the ride as a "tempo" ride. Nearly 40 inches of snow has fallen since Jan. 2. That would translate to a 120-inch snow month if it continued at this rate, but it's not going to. A warming trend has commenced, and rain is in the forecast now. I wish the rain would hold off for two more days. After that, I'll be gone. But it probably will come Sunday. And when it does, rain on top of several feet of dry powder snow is going to make everything, and I mean everything, horrifically sloppy, nasty and completely unbikeable. Since I've lost my momentum in my 10-day training binge anyway, I see a bit of slumming at the gym in my near future. I haven't posted about the book in a while, but it's still available. I've made a few edits since the original version and it is slowly becoming more polished. Such is the nature of spontaneous indie publishing. I've sold a little more than 500 copies since November, which is awesome! I'm slowly working on increasing the distribution. It's available now at Hearthside Books in Juneau and Speedway Cycles in Anchorage, and should be up on Amazon.com pretty soon. I'd love to further increase the distribution, but have taken close to no time to actually market the book. I still have yet to send out review copies to several magazines and publications that requested one (I keep running out of my own stash of books.) If you have a favorite little bookstore or bike shop that you think may be at all interested in stocking a book like this, send me an e-mail at jillhomer66@hotmail.com and let me know where/how I can contact them so I can send them my pitch. I'm happy with the lucrativeness of this book so far, but I think I've nearly tapped out the market from my blog. Time to branch out. I don't know the guy on the right, but the guy on the left is drj0n. Your book is a great read, and it's about more than the Iditarod (although that's a big enough topic by itself). As a reader, it seems like your book is about facing down your own demons. For many of us, the biggest demon of all is self-doubt, and you describe its insidious effects beautifully. This description is enhanced by how you weave together your experiences from years ago with your Iditarod experiences. A reader can see how you've grown and changed through the years from these myriad of experiences. For anyone who wants to be inspired to venture beyond their comfort zone, your book will provide inspiration! A little sand paper will both reduce the diameter of your seatpost slightly and give it a rougher surface for more grip. However, more than likely the problem is not the post being too big, but a bit of rust making the tube on your bike too small. That picture is so funny! And I have started your book! You are amazing! It's been great so far. I just finished your book. I have to say I found it highly inspirational and amazing. I don't know how you kept going! My wife is now reading it, and my 10 and 13 year old daughters will read it after that. I am a regular reader of your blog, and like many others, followed your progress last year. Thank you for taking the time to write Ghost Trails, and I wish both you and Geoff the best of luck in the 09 race! Don't forget to pack lots of candy this time. Thanks for the link Jill and I can't wait to read your book. Hey Jill....I spoke with Geoff a bit about this already, and I think that some of the local shops here would strongly consider stocking your book. Given that you are from here and that several misadventures occured in Utah I would think it would have considerable appeal. I think that the Moab book and bike shops would absolutely be interested, given thier commitment to local writing. Anyway, I know someone at Wasatch Touring, and will talk to him about it with your permission, as well as several other shops. Oh, and REI has a section dedicated to writing by locals/about local wilderness recreation. Pretty much what I am saying is that i think you should get down here and do some marketing, find a way to write it off as business, and hang out for a week or 10. We could talk to Jamie and others, set up a showing of your photography at Gallery Stroll, or something of the like, do a book signing at King's English, and a charity ride with Author Jill Homer on behalf your efforts toward the Cancer cause, etc........ The possibilities are limitless. Marketing is key, unfortunately, in this "Image is everything" world we live in. I'm not asking you to sell out to the masses, but I've read your book and I do believe it has appeal to a much wider audience than your blog, so why not?! I'm happy to help in any way. I sent you an e-mail how you could promote your book outside the USA. Just make sure it didn't end up in your Spam filter. Just looking at that photo of the angle of your knee makes mine hurt ! Seat post is way too low IMHO....as a comrade distance biker I've felt your pain way too long after a short amount of time with a maladjusted seat post. I read your blog over a year or two ago, but lost the link. Mel commented on my blog and I went to her blog to check it out and saw your blog again as her favorite. The world is so small! So someone reading your book and your seeing it online is in the same vein. I used to live in Alaska (20 years), but the weather got to me and now we are in Raleigh, NC. Talk about easy living. You are amazing! Best of luck with your books, etc. 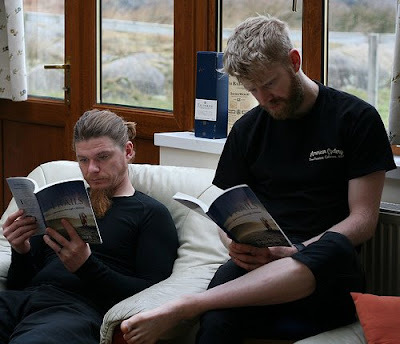 LOVE that photo of the guys reading your book!! 500 copies is awesome! Well done. I still think you could potentially get REI to carry the book, at least the Anchorage store. Especially if you did a signing. Aloha ... can I come back?